Not in Southern CA, but unquestionably one of the ultimate runs for any trail runner. Back and forth across the Grand Canyon in one day. Rim-to-Rim-to-Rim. 44-48 miles (depending on route), over 11,000' of total elevation gain, and an unforgettable experience. 5/1/11 After making the 8 hour drive from Southern CA, we arrive at the South Rim of the Grand Canyon in the early evening. 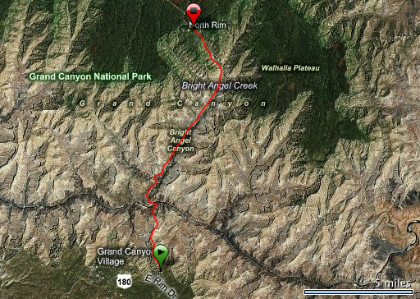 The plan is to scout out the trailhead, parking situation, and food options in preparation for the next day's run. 5/2/11 The big day. The South Kaibab trail from the South Rim down to the Colorado River and Phantom Ranch. Then the North Kaibab trail up to the North Rim and back down to the river. Then finally the Bright Angel trail back up to the South Rim. 46 miles and over 11,000' of elevation gain. 5/3/11 A day to recover and just act like tourists. We walk the Rim Trail from Mather Point to Yucapai Point to the El Tover hotel and then drive out to the Watchtower at Desert View. A few maps and elevation plots generated from the GPS data taken during the run.